The FBI has executed search warrants at both the ward office and City Council office of powerful Ald. 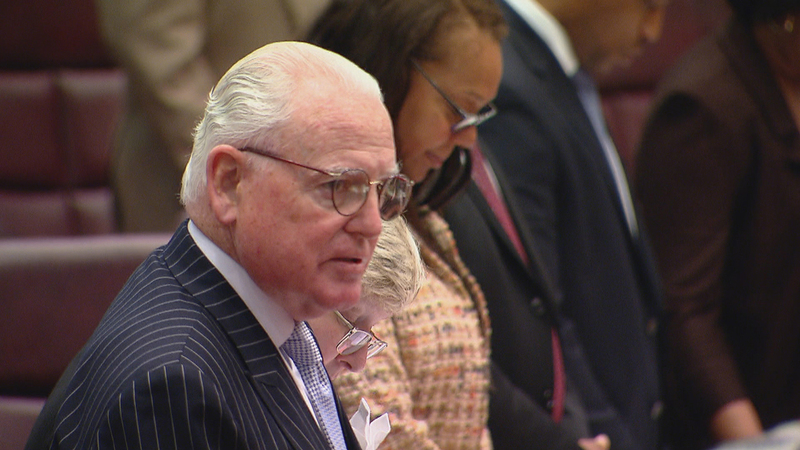 Ed Burke, City Council’s longest serving member, the agency confirmed Thursday. It’s unclear what exactly the FBI is looking for, but according to criminal defense attorneys, a search warrant means that nearly everything is fair game. Monico said he did not want to speculate what kind of information they might be seeking in this specific case. He echoed that statement Thursday evening, telling reporters gathered outside his home repeatedly that he will cooperate and that he is sure nothing will be found to be amiss. He would not say whether he’d talked with the U.S. attorney’s office or what he may be under investigation for. On Thursday morning, the windows to Burke’s offices were covered with brown paper and tape. A Cook County security guard says he saw what appeared to be between 15-20 men dressed in suits and ties walk into City Hall through Randolph Street at around 10 a.m., apparently headed up to Burke’s third floor office. Burke’s Southwest Side ward office was similarly papered. About 1:25 p.m. Thursday, the paper appeared to be coming down. Burke has served as alderman since 1969 and has served as the chair of the powerful Finance Committee for more than three decades. In his nearly 50 years in City Council, Burke has had previous run-ins with the federal government. In 2012, the U.S. attorney’s office subpoenaed records relating to the city’s $100 million workers’ compensation program, which Burke controls out of the Finance Committee. That year, Burke also turned over some of those records to the city’s then-legislative Inspector General Faisal Khan, whom Burke had brought in from New York to lead the new office. Khan said Thursday he couldn’t comment on any investigation he had conducted with Burke’s records, or whether he had cooperated with federal agents. The office of legislative inspector general was eventually abolished after City Council gave Chicago Inspector General Joe Ferguson the power to investigate alderman. But Burke was crucial in making sure Ferguson’s authority would not extend to overseeing council committees, like the Finance Committee. Ferguson has been in a legal tussle with Burke since then to get access to and scrutinize the records. In July, former city workers sued Burke in federal court, alleging it’s illegal for Burke to control the workers’ compensation program. Thursday’s news comes as Burke faces a potentially tough re-election challenge. Jaime Guzman, Jose Torrez, Tanya Patino and Irene Corral have filed to run against him. Guzman, Torrez and Patino have ties to U.S. Rep.-elect Jesus “Chuy” Garcia, who provided support to defeat Burke’s brother, Dan Burke, in the Illinois General Assembly. Prior to his election as alderman, Burke served as a Chicago police officer from 1965 to 1968. Burke is a partner at the law firm Klafter & Burke and married to Anne Burke, a justice on the Illinois Supreme Court who was scheduled to be sworn into office Thursday.